I think that the best way to describe this book is "delightful". Veronica "Ronnie" Somerset is a female RAF pilot during WWII. The Nazis are about to start the invasion of Britain and Ronnie is trying to get the support and attention that she deserves from the male dominated British Royal Air Force. The RAF, on the other hand, is trying to minimize her role. They think they have succeeded by stationing her at a remote base in Cornwall that is shared by the RAF and the Navy. In actuality, though, they have placed her in the perfect place to play a pivotal role in the fight for the UK. I have to say upfront, I am new to the genre of Steampunk/Dieselpunk, but with each book of this type that I read, I am finding that I really enjoy it. To me the genre is all about mixing sci-fi (as far as the machines, etc. go) and magic or mysticism, which DragonFly by Charles A. Cornell does in just the right amount. The book is full of imaginative machines, the best examples of which in my mind, are the DragonFly planes and Blitzkrieger. These are just two of the really imaginative and inventive items included in the story, though and all of them are fun to read about and consider. On the magic side, there is a bit of Druidism and some thought telepathy that represent this aspect quite well. 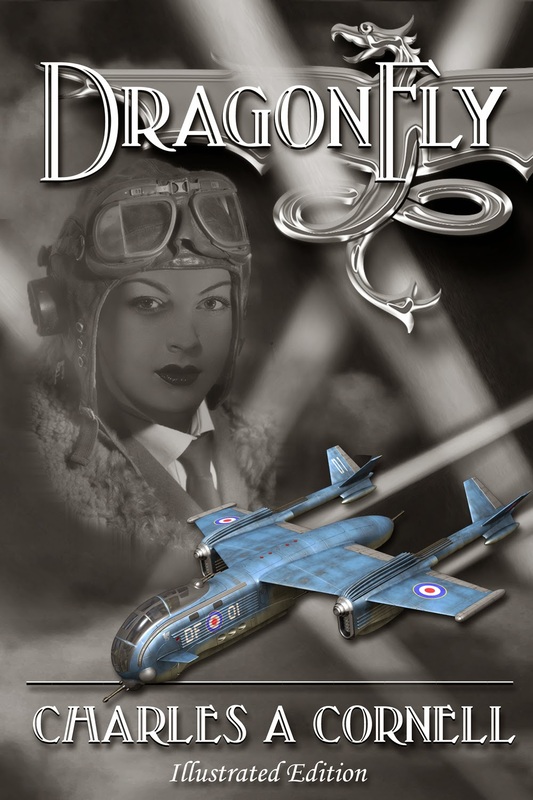 No story can survive, though without a good plot, and the good vs. evil plot of DragonFly is excellently drawn. Set in WWII, the outcome of the story should be etched in history, but this is "alternate history" and the author is free to take the story where he will. He does this in admirable fashion, keeping the reader on the edge of his seat trying to decide if "good" will triumph over "evil". As a self-titled aficionado of history, I really appreciated the way that Cornell wove the just the right amount of the factual history of WWII in with his fantasy story to give it a strong foundation, yet allow it to be unpredictable. I think my favorite part of this book, along with the DragonFly plane itself, were the characters. There were so many characters in this book that I thought were exceptionally well done. I loved the fact that the RAF pilots were all women and had to fight for the chance to play a part in history. As for the rest of the British characters, they came across as a unique blend of British stability and optimism. The Germans, on the other had, were very dark, their plodding steps, ulterior motives, and subterfuge painting the perfect picture of the stories "evil". If there was one thing that was off in Cornell's characters for me, though, it was the origin of the Blitzkriegers, which was a little hard for me to wrap my head around. So, with one minor drawback, I thoroughly enjoyed this story. At times I found myself wanting to be Ronnie, flying a DragonFly. At other times I found myself worrying over who would prevail in battles, or who would make it through to the end. At all times, though, I found myself entertained and wanting to keep reading more. I am definitely looking forward to other DragonFly Squadron books, and hope that this episode is able to overcome its somewhat limited availability. I would definitely like to thank both the author, Charles A. Cornell, and the E-book Miner group on Goodreads for bringing this book to my attention. If not for them, I don't know that this book would ever have made it onto my radar, but I am very glad that it did!